Thu., Jan. 25, 2018, 8:49 a.m.
A GRIP ON SPORTS • As anyone who follows college hoops around these parts knows, the weekend really begins on Thursday night. And this week is no different. Read on. • Though the West Coast Conference has gone away from travel partners, and home weekends this season, the league has been gracious enough to keep to the Thursday-Saturday schedule. Which allows its fans to always lock in a day, if not a complete home – or away – weekend. The same can be said about the Big Sky. The Pac-12? Not so much. But there are enough Pac-12 schools – in an oddity among conferences, namely the Big Ten and the Big 12, the league actually does have the correct number in its name – and enough games each weekend, there is plenty to fill up Wednesday, Thursday, Saturday and Sunday. And sprinkling games over four days allows more of them to appear on your television. That’s a problem with the WCC, especially tonight. The Zags’ game starts at 8 on ESPNU and I’m guessing a majority of the conference fans in this area will be watching. A large majority. Though there is a better matchup on ESPN2. That would be BYU at Saint Mary’s, two teams that played an overtime thriller in Provo earlier this season. If the Zags do to Portland tonight what they did in Spokane a couple weeks ago – you know, when there was snow on the ground – than more than a few TVs will probably be switching over at halftime or so. If I were an ESPNU executive whose bonus depended on keeping eyeballs engaged, I would be rooting hard for the Pilots until about 9:30 or so. Then I would probably switch the channel. • We had our say about Edgar Martinez yesterday. And you probably know he came up short of making baseball’s Hall of Fame by a few votes. So we’re going to let others guide you through the grieving process today, most notably our John Blanchette, who covers Edgar’s omission in this column. We also have added links to other columns in the Mariners’ section below, as well as views from around the nation. WSU: Women’s basketball coach June Daugherty is taking a medical-based leave. Daugherty recently underwent an unspecified procedure and has missed the Cougars’ recent games. … New athletic director Pat Chun sat down with the Times’ Stefanie Loh yesterday for an interview. It’s obvious the new Washington State athletic administration is going to concentrate on Western Washington more than it has in the past. It makes one wonder if this area has lost a little of its importance among WSU's powers that be. … The Bears seem to have some interest in Luke Falk. Elsewhere in the Pac-12, the weekend tipped off last night with USC holding Stanford at bay in a home contest. The Trojans and the Cardinal have played two tight games this season. … The conference is trying to figure out how to deal with basketball’s underbelly, recruiting. … The Pac-12’s biggest problem this year is the talent level is down. … California has little of it. … Arizona has a lot, and will need it all when Colorado visits tonight. … The Wildcats are still dealing with the FBI probe. … Oregon and Oregon State are off until they meet Saturday night. … Speaking of Oregon, the athletic department has undergone lots of change. … Arizona State has big plans for its venerable basketball arena, which will host Utah tonight. 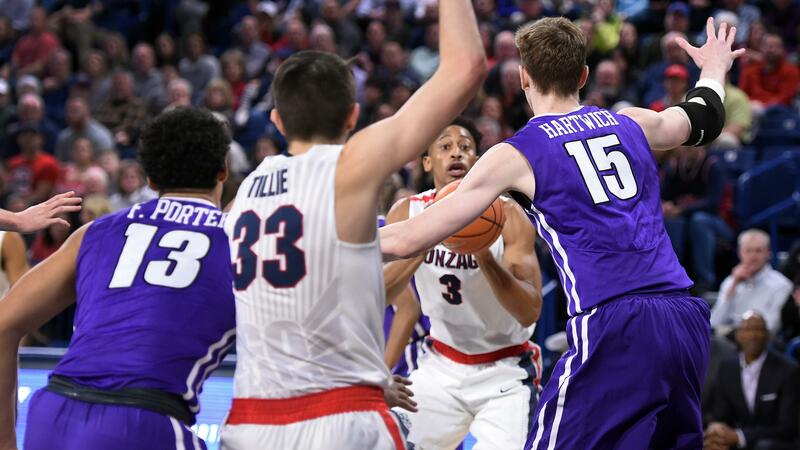 Gonzaga: The second regular season battle with Portland is on tap tonight. Jim Meehan has a preview and a story on a new member of the Pilots’ starting lineup. … The women are atop the conference standings and will host Portland tonight. Jim Allen previews that game and the weekend. … Around the WCC, as we said above, while Gonzaga tries to win in Portland, BYU will try to upset Saint Mary’s in Moraga. It’s a tough task. EWU: Venky Jois hasn’t held the school scoring record for all that long, but he should drop to second on the list tonight. Bogdan Bliznyuk will become No. 1 at home against North Dakota. Jim Allen has the story. Idaho: Peter Harriman has an interesting piece on two Vandals, Trevon Allen and Chance Garvin, and what their presence on the Idaho roster represents. It’s not to be missed. CCS: The men’s basketball team ran over Blue Mountain last night, 107-73 on the road. Chiefs: Spokane has won four consecutive games, the latest 5-0 over Vancouver in Canada. … Former Chief Tyler Johnson continues to spark Tampa Bay. Preps: Wednesday nights run the gamut of sports, from girls and boys basketball to wrestling and gymnastics. We have roundups of each of them. … Dave Nichols’ feature this week highlights the Groves family and Shadle Park High. Mariners: As the voting wound down, most folks, including Edgar, knew he wasn’t going to make it this year. So the news yesterday afternoon wasn’t shocking, like turning on a light bat. On to next year. … There will be four inducted in July and two others from the Modern Era committee. Seahawks: Roster questions are always interrelated. … The coaching staff is still changing. Published: Jan. 25, 2018, 8:49 a.m.